DH-1064: Fits 7/8" and 1" handlebars. Holds most beverages with a closure top. Simple to mount. 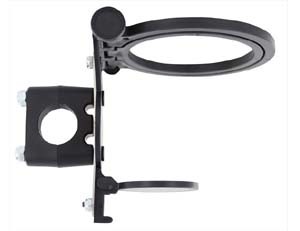 All kits feature mounting bracket, hardware and rings fully assembled. Mounting bracket attaches directly to handle bar. Allen Wrench included. Designed and Made in USA (cup shown in photo not included). 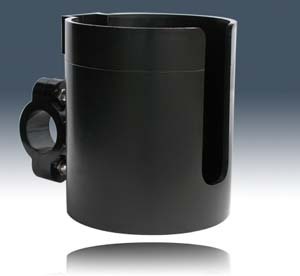 BW-28: Designed to accommodate almost any drink or beverage container you want to keep with you while riding. It is made of high impact polycarbonate that won't scratch chrome and comes with OEM manufacturer’s guarantee against breakage. If it breaks, factory will replace! Fully adjustable. It will not swivel or tip and spill your drink. 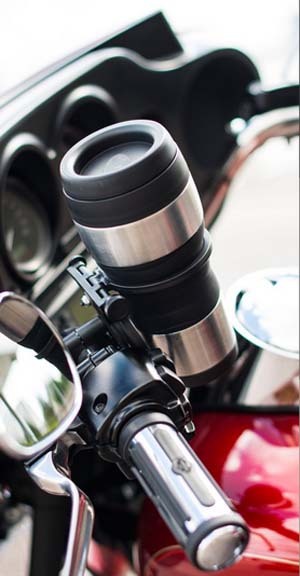 This clever device has set the standard for motorcycle beverage holders and is still the most versatile, durable and reliable product of it’s kind available on the market. All parts made and assembled in the U.S.A. FREE can and bottle koozie with every drink holder! 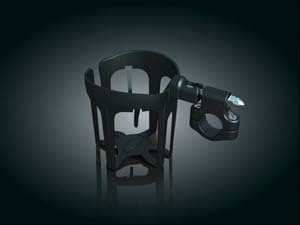 SG Snap-n-Go Drink Holders: These affordable drink holders mount on either the clutch or brake perch mounts or a 1" bar. With secure snap-on mounting, simply Snap-N-Go to install or remove. When removed it leaves an unobtrusive stud on your perch or a small clamp & stud for universal bar application. Select the drink holder style you desire & ride with the plush comforts you deserve. 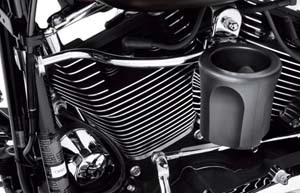 HT-DT-B: Shaped to blend with the contours of your Harley-Davidson® motorcycle, this unique cup holder is easy to reach without cluttering the handlebar. 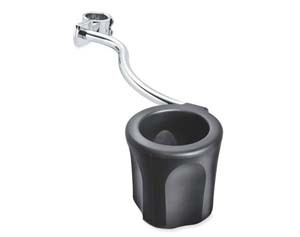 Securely attaches to the frame downtube, and sweeps rearward to support the cup holder. 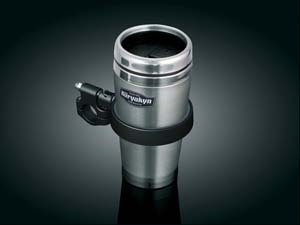 Soft-touch insulated holder flexes to grip the beverage, and features a perforated bottom to drain away rain water. 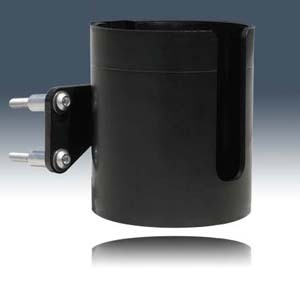 Kit includes model-specific clamp, support rod, cup holder and all required mounting hardware. Fits '09-later Touring and Trike models. Does not fit '14-later Touring models with Fairing Lowers. 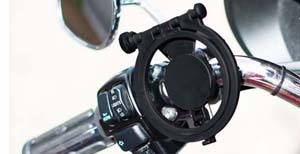 HT-DT: Fits Electra Glide, Road King, Street Glide, and Road Glide FLH-FLT 2008 & older. 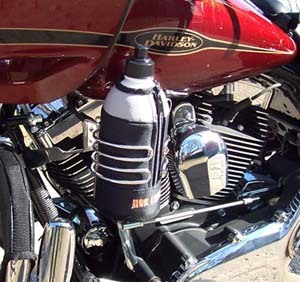 Places Drink Holder on left side of Gas Tank. Quick Disconnect that Clamps on Frame Down Tubes. Fits Harley Davidson’s with 1 ¼” down tubes. 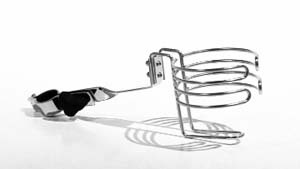 Built out of Polished Stainless Steel. Doesn’t Interfere with Fairing when Front Forks are in the Locked Position. 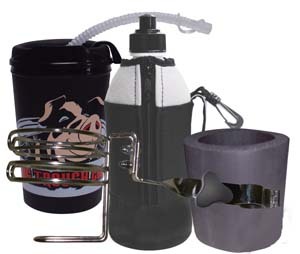 Includes: 1 Liter Insulated Water Bottle & 20 oz Insulated Mug. 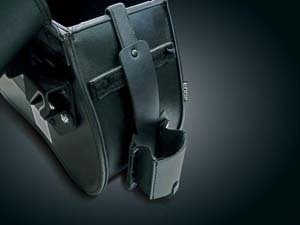 Saddlebag Cup Holder: Slide onto the inside edge of saddlebag, insert beverage & ride away. 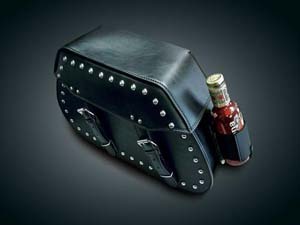 Can also hook onto belt to carry beverage with you.